Shellfish farms must be closed if there is suspected contamination during production to avoid serious health hazards. The authorities monitor a number of environmental and water quality variables through a set of sensors to check the health of shellfish farms and to decide on the closure of the farms. 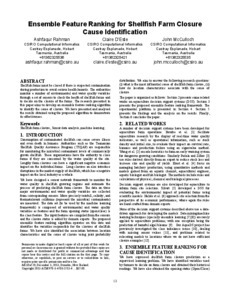 The research presented in this paper aims to develop an ensemble feature ranking algorithm to identify the cause of closure. We have presented and analysed the results obtained using the proposed algorithm to demonstrate its effectiveness.